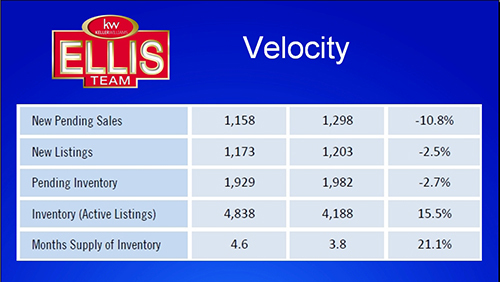 One of the things we like to study is the SW Florida real estate market velocity. In a snapshot it tells us several key indicators about the state of the local real estate market. We used this graphic at a recent filming of our Ellis Team Seller’s Club video shoot. Each month we dive deep and share key factors we’re looking at and how they’re affecting various segments of the market. For instance, the market doesn’t all move at once. Certain segments may lead and others follow. Because it’s a video we’re able to illustrate more than just a graphic or two and 700 words. We can really explain each force and its effect. One of the numbers we look at not on this graphic is Total Dollar Volume. Total dollar volume is down 27.7% in July. Last year Realtors sold $420.4 Million dollars worth of residential real estate. In 2016 was $304.1 Million in July. Two factors contribute to this decline. First, closed sales were down 17.3% Secondly, average sales price was down 12.6%. That’s a double whammy to the market. While these two numbers aren’t on the velocity graph, it does confirm a few trends on the graph. Listings are up and new pending sales are down. Now you might ask, if new listings are down 2.5% how is it that overall active listings are up 15.5%? This can be for a number of reasons. Older pending sales could have fallen out and come back on the market. These would not be new listings. And even though new listings entering the market declined, new pending sales are roughly equal to the new active listings. So if any pending contracts fall out, and some always do, it adds to the listing inventory. Lastly, inventory has been rising. It’s actually down from where it’s been in the last few months, but definitely up over last year. When you hear the market is up, down, or sideways, it doesn’t tell the whole story. The headline tells one story, but the market may have several stories to tell. Right now there are 3 distinct markets with a possible 4th developing. We have the buyer’s market, the neutral market, and the seller’s market. In our Seller’s Club video we dive into which segments are in the buyer’s market, which ones are neutral, and which ones are seller’s markets. Knowing where your home stands is important to know. And if you’re a buyer, this is also important information as it dictates how much you can gamble in your negotiations. We’ll be starting up a Buyer’s Club soon so buyers too can see in-depth information. Whether you’re buying or selling, it pays to understand where the market is today, and where it’s headed. Interest rates and economic events can also influence the markets and we bring you our analysis on those as well. If you’re a seller, you can find out what your home is worth online, or view the same neighborhood reports. Neighborhood reports show you all the homes for sale, pending, and sold in particular neighborhoods. It also shows you time on the market for each listing, dollar per sq ft calculations, sold dates, and photo galleries of each listing. Of course there’s no substitute for working with experienced agents who know the market. Our website is for those that wish to do their own research before speaking with a Realtor. If you’d like to be added to our Buyer’s Club or our Seller’s club, send me an e-mail at Brett@topagent.com and let me know which one. We’ll get you on the list and on your way to receiving these great in-depth monthly video reports. If you have a home to sell, please call us at 239-489-4042. Ask for Sande or Brett and we’ll be glad go over our marketing and show you why our homes sell faster and for more money! Good luck and Happy Labor Day Weekend! Posted in Cape Coral, Cape Coral Real Estate, Fort Myers, Fort Myers Beach, Fort Myers Real Estate, Southwest Florida Real Estate.Tagged Ellis Team Seller's Club, Market velocity, neighborhood reports, SW Florida real estate market.